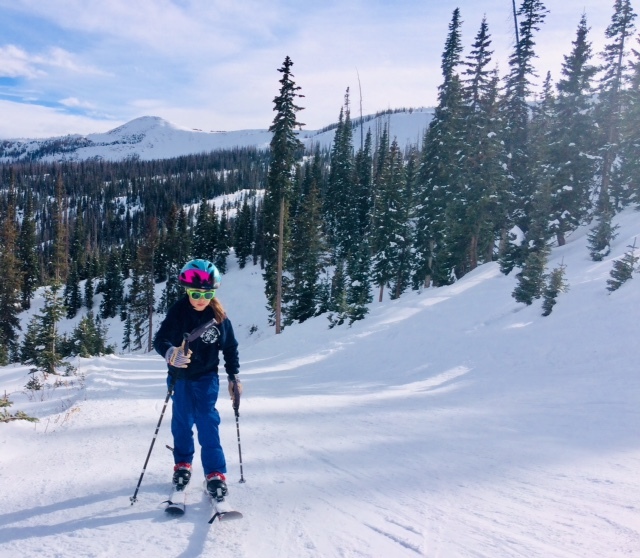 pic of Dewachen Ilg (11) this Saturday at Wolf Creek during her maiden voyage into yet another one of her Daddy’s most cherished outdoor sports; Skimo. Skimo is short for “Ski Mountaineering” and is one of the most rapidly growing Winter Sports. The activity includes several skillsets which make it a PERFECT FIT for Wholistic Fitness® Warriors and Warrioress’s! The Tao would at first, would not approve. The Tao is ancient Chinese philosophy which means flowing with life in the Watercourse Way. In feeble ilg’s standing-under (aka; understanding) of our One Poem (aka; Uni Verse)? The Tao is actually WAAAAAAY more fervent and beautiful in Her uphill fashion! and ilg knows this by way of Skimo! Skimo involves skiing uphill (yeah, that’s right, skiing UPhill; it’s not an oxymoron) by way of ‘skinning,’ which means we attach ‘climbing skins’ which are traction garments under our skis which enable us to stick like velcro to the snow while making our way upslope. They are called “skins” because the ancient lineage of Skimo pioneers would apply moleskin to the bottom of their skis to navigate the uphills of their skiing routes. Dewa was FASCINATED by the feeling and by the physics of skinning, “DADDY!!! I can’t believe I’m not slipping backwards! 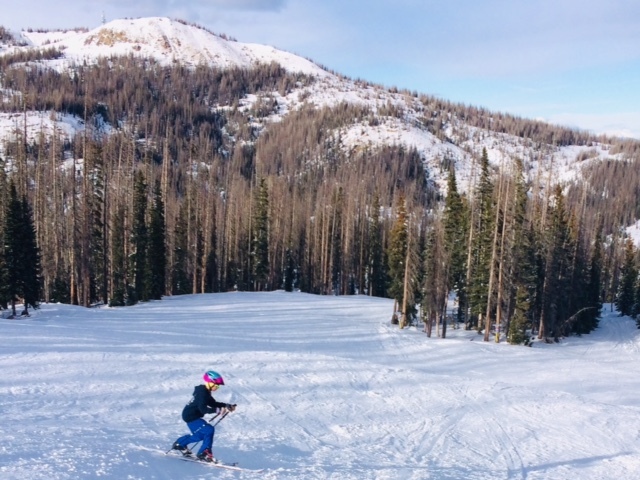 How am I DOING this?” Kids LOVE uphill skiing if properly introduced and physics and metaphysics are crazy easy to portray to their spongy minds and spirits! in the above pic, you might squint hard enough at the tips of Dewa’s skis to see webbing flaps. those are anchoring the sticky ‘skins – which are kinda like micro-astro turf pelts – whose fibers allow a slight glide uphill yet limit backslipping until the steepest of slopes. In c(om)petitive Skimo things are really crazy steep and require advanced techniques including tic-tacking back and forth across insanely steep pitches of ice/snow/rock whereupon you learn how to step-turn your skis against the near-vertical slopes. when we simply cannot ski up something? 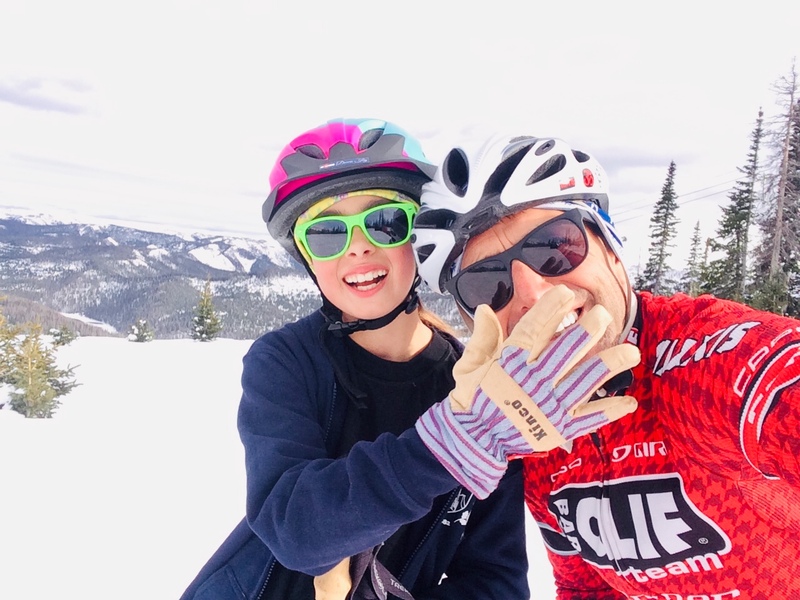 there is a whole crazy skillset of getting out of your skis, packing them, and then climbing upward using ski poles, hands, cables, or ice climbing picks! Skimo also involves skiing downhill. Modern Skimo equipment (a LOT of coin!) includes SUPER LIGHTWEIGHT SKIS (competitive Skimo skis are 160mm in length) and SUPER LIGHT MULTIFUNCTIONAL bindings which allow for lightning fast transitions fr(om) uphill to downhill and back again. Skimo bindings magically allow Nordic (free-heel, heel is unattached to the ski) locomotion for the uphills, and then switch into an Alpine (fixed heel) for the descents! i KNOW, right!?!?! Skimo boots are mind-blowingly light and flexible for uphill yet torsionally stiff for downhills. Usually, in racing? It’s all RAMBO STYLE on the descents; it ain’t purty, just effective. You must be fast yet safe when skiing down extreme terrain on a ski designed for versatility instead of specificity. Utterly WHOLISTIC! For Dewa? I’ve chosen to introduce Skimo to her in the traditional ‘randonee’ style which requires using the very technical ‘telemark’ technique. the Telemark (named after Telemark, Norway where the technique originally evolved hundreds of years ago) is hallmarked by the unmistakably aesthetic, elegant knee-drop as Dewa is already manifesting in the pic above – which simply means the heels remain Nordic. why doth feeble ilg raise Dewa via Telemark technique instead of just clamping down Her heel? well, one reason is that a freed heel is safer on the knees and the other is that ilg reckons ilg would not have ever reached one Skimo podium if ilg did not grow up Nordic. Nordic builds snow and ski edge sensitivity unc(om)parable to those who just ski Alpine (fixed heels). so yeah, that’s kinda like a Skimo primer. an intricate and bedazzling world awaits the Skimo skier who is brave enough to turn their planks uphill, against the steady stream of conventional skiers and enjoy Higher Fitness, Skills, and Spiritual Realizations along the Uphill Way!